March is often a time in the grain markets where we can see movement in the production area of South America, which can be impacted by weather events. The big US crop has long been put away and is slowly moving out to end-users across the greater hinterland. Problems in Argentina with severe drought conditions have dominated the landscape over the last 30 days as prices have gone up to become much more volatile based on this weather market. Increasingly so, farmers need to watch the weather maps of South America to get clues of production conditions in the southern hemisphere. The USDA is starting in on their projection season. On February 22nd during their Outlook forum predictions for 2018 corn and soybean acres came in equally at 90 million acres. So let the games begin. An even bigger USDA report will come March 29th when the USDA releases its prospective plantings report. Markets will be focused on that day to see if there are any surprises. On March 8th, USDA increased its demand numbers for corn. Corn exports were increased by 175 million bushels to 2.25 billion bushels. Corn used for ethanol was increased by 50 million bushels to 5.575 billion bushels. USDA actually reduced the Argentina corn crop to 36 MMT and the Brazil crop to 94.5 MMT. The USDA actually lowered soybean exports by 25 million bushels. However, at the end of the day they raised US domestic ending stocks to 555 million bushels. USDA raised their Brazil soybean production to 113 MMT, but cut Argentinian soybean production to 47 MMT. On March 11th, corn, soybeans and wheat futures were higher than the last Market Trends report. May 2018 corn futures were at $3.90 a bushel. The May 2018 soybean futures were at $10.39 a bushel. The May 2018 Chicago wheat futures closed at $4.89 a bushel. The Minneapolis May 2018 wheat futures closed at $6.17 a bushel with the September 2018 contract closing at $6.32 a bushel. The nearby oil futures as of March 11th closed at $62.04/barrel down from the nearby futures of last month of $59.20/barrel. The average price for ethanol on March 9th in the US was $1.63 a US gallon down from last month at $1.70 a US gallon. The Canadian dollar noon rate on March 9th was .7788 US down from .7931 US reported here last month. The Bank of Canada’s lending rate remained at 1.0%. In Ontario winter continues to hang on although some wheat producers are actively spreading clover to still frozen fields. However, it is now mid-March and Ontario is due for some early warm weather, which will surely jumpstart farm preparation across the province. Grain is moving. For instance corn continues to be shipped East into Quebec and off shore into Europe taking advantage of the tariff free status from the CETA agreement to Europe. Official Stats Canada yields have not changed from 169.5 bushels per acre for corn, but Agricorp has published a yield of 184 bushels per acre showing just how robust last year’s corn crop was in Ontario. It will continue to weigh on old crop corn basis going into summer. The Canadian dollar dropped from last month based on perceived problems in the Canadian economy brought on by possible trade action with United States. Of course, the Bank of Canada kept interest rates the same and this also weighs on the value of the loonie. Needless to say as the loonie dropped it did provide basis appreciation especially for soybeans and wheat. 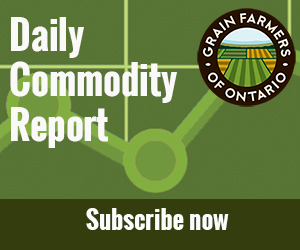 Flat pricing of Ontario grains with elevated futures and lower Canadian dollar values has provided opportunities. Old crop corn basis levels are $.65 to $1.00 over the May 2018 corn futures on March 9th across the province. The new crop corn basis varied from .65 to $1.05 over the December 2018 corn futures. The old crop basis levels for soybeans range from $2.10 cents to $2.20 over the May 2018 futures. New crop soybeans range from $2.10-$2.22 over the November 2018 futures level. The Grain Farmers of Ontario cash wheat prices for delivery to a terminal on March 9th were $6.21 for SWW, $6.15 for HRW, $5.96 for SRW and $6.57 for Red Spring Wheat. On March 9th the US replacement price for corn was $5.43/bushel. 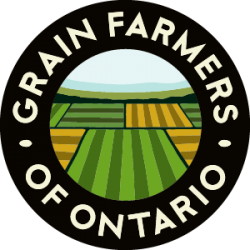 You can access all of these Ontario grain in the marketing section at gfo.ca. Nobody knows where grain markets will go next. Measuring market factors are always key. Case in point is the Argentina drought. All of last fall and winter we knew that South American weather would affect crop prices and that’s exactly what has happened with the dry weather in Argentina. Computer trading algorithms have all of that built into them now and the uncertainty has raised prices significantly. It was always out there, but then it actually happened. Having said that, it still is a weather market, which tends to be very fickle. As of March 9th we’ve actually seen it retreat in the soybean and soybean meal price. For instance on Friday, March 9th, soybean meal produced the largest percentage loss among the grain contracts. May soybeans lost $.24 on the day and were down $.30 on the week. That is one example of how volatile the soybean contract can be within a weather market. Geopolitical events are also weighing on our market prices. President Trump’s threat of tariff action on Canadian steel and aluminum spooked the currency market for a few days. However, this was alleviated by an exemption for both Canada and Mexico. This exemption according to the Americans is due to the ongoing negotiations of NAFTA. Of course, China seems to be in the crosshairs of the Americans and this is making the soybean trade nervous. With China’s propensity for South American soybeans obvious, the Chinese tariff on US soybeans would be devastating to the futures price. That’s the worry, but of course it’s all a theory now. Keep in mind that the Brazil soybean crop continues to grow with some private estimates at over 117 MMT, while the USDA sits at 113 MMT. Yes, Argentina has lost metric tonnes, but Brazil keeps adding them, but not as much. There has also been issues with harvest in Brazil with too much rain making it hard to plant the second crop corn. These issues will remain over the next few weeks and producers will need to watch for daily market and weather signals from South America. It would seem that the corn price even with onerous stocks might be set to benefit from the future. For instance, corn production is projected to go down around the world, even in North America to some extent. At the same time ethanol demand is up and there are more cattle, poultry and hogs on feed worldwide. December 2018 corn hit a six-month high on March 8th at $4.10. This is reflective of increased demand overall. Obviously going forward, producers will need to focus on this new crop month, as there is much risk ahead. Last year, December corn got to this level in July, so it’s obviously a different year. The May 2018 July 2018 corn futures spread is currently -7.5 cents as of March 9th. This is considered neutral. Seasonally, futures tend to trend up this time. The May corn contract is currently priced in the upper 41% of the past five-year price distribution range. The drought in Argentina has been on the front burner of the market over the last month. Both the USDA and the Buenos Aires grain exchange have reduced the Argentina crop. Rain will eventually come, as this is a classic weather market. As the world’s largest soybean meal exporter, it’s significant. During the drought the May soybean meal contract rallied $90/tonne. How much will this affect planting decisions in North America come spring? Clearly, soybeans have created some excitement in the grain price arena not seen since last July. If producers take the bait of $10 soybeans in the United States and $13 beams in Ontario, there will likely be more soybeans everywhere. The May 2018 July 2018 soybean futures spread is minus nine cents as of March 9th, which is considered neutral. Seasonally, soybean futures tend to trend up through May. The May 2018 soybean futures contract is currently priced in the upper 44% of the five-year price distribution range. The wheat market has been dominated lately by the severe drought in the United States. The drought in the southern Plains continues to get worse and this is been reflected in Kansas City wheat futures. However, it has also had an effect on the soft wheat market in Chicago. Expect an increase in HRS wheat acres to be planted this spring, which are traded at the Minneapolis exchange. In Ontario wheat fields are emerging to some extent winter snows. Clover is being spread. Prices have also improved over the last month and many producers will be taking advantage of the flat prices offered especially at a time when the loonie is down. The wheat market continues to be buffeted by drought in the US southern Plains and this has somewhat of a ripple effect across the other wheat classes. This is true even though the different wheat classes usually have different market fundamentals. This is an aside from all the wheat that’s produced overseas in places like the Black Sea region, Europe, Australia, China and in Argentina. If the drought continues in Argentina it will affect wheat planting. So it is always difficult to know how wheat prices will react. We do know that it is hard to kill wheat; it has many lives. It is almost like the corn market wants to have life even though onerous stocks in the United States weigh it down. Soybeans have dragged the corn price up a bit, but will probably drag it down if the weather market changes in Argentina. We know that corn production worldwide is set to be down, southern hemisphere production now is down and livestock numbers are way up. However, even though seasonally corn futures tend to go up in the spring, the March 29 USDA report looms as a major market flashpoint for corn. The 2018 US corn acreage intention will be key to corn prices within the next few weeks. What never changes in the Ontario cash grain price paradigm is the value of the Canadian dollar, which has a big impact cash prices. With the American trade rhetoric of the last few weeks the loonie actually dipped under $.77 in the week of March 9th. This has led to some very attractive flat prices for producers, that seeming sweet spot where one is comfortable between futures price and Canadian dollar affected basis level. With much risk on the table moving forward into July, daily market intelligence will remain key to capitalize on these flat price opportunities. The last few weeks proved that weather in the world’s crop areas could be a very fickle thing. The drought in Argentina has created grain-marketing opportunities. 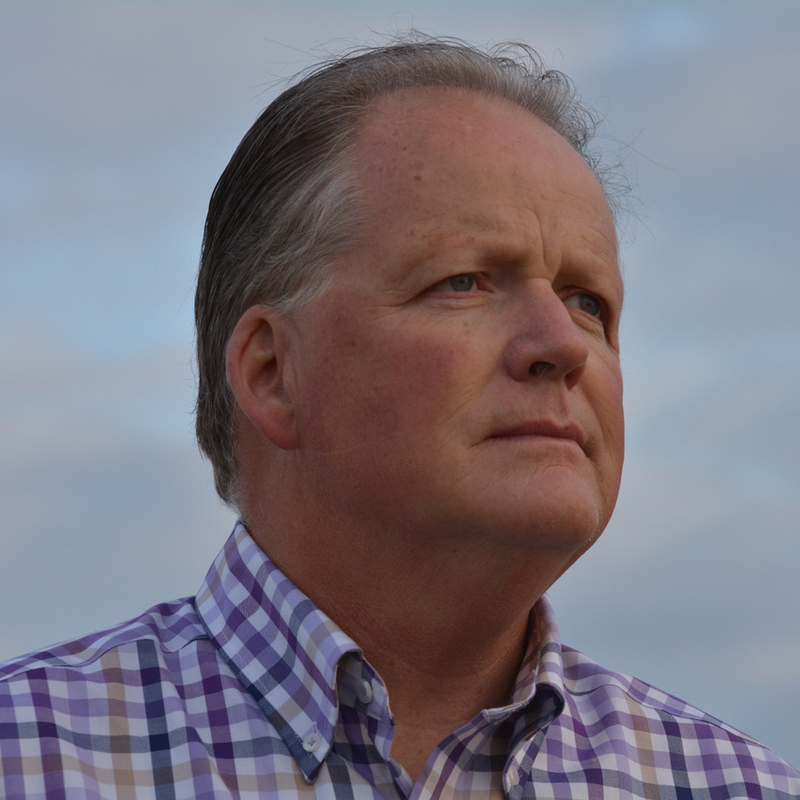 On March 29th USDA will release its perspective plantings report. This is one of the 3 major “market moving” reports of the year along with the January report and the June 30th report. It will likely be a flashpoint for the market giving direction for April. Of course, South American weather remains critically important during this period. The challenge for Ontario farmers is to measure all of these marketing factors in sequence with the value of the Canadian dollar. Watching the market every day will be important. The risk on the table is substantial. The market will surely produce some risk premium.